Hello and welcome to the website for Composing Music for Games. Composing Music for Games covers all aspects of composing, recording and marketing your sound for games and is perfect anyone looking to break into the video game sound industry. 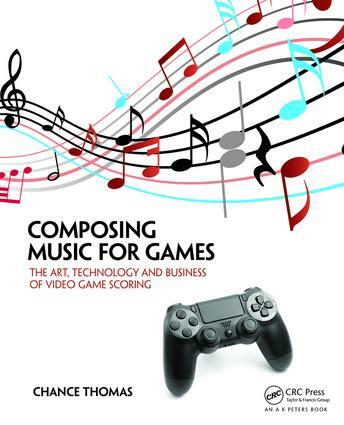 Filled with tips and shortcuts, this hands-on, practical guide gives advice on how to launch and maintain your career as a successful career as a video game composer. This guide also offers a pragmatic approach to learning, intensified through challenging project assignments and simulations. The website will offer a powerful blend of aesthetic, technique, technology and business, in addition to audio and visual examples that will help facilitate a successful career as a video game composer. Chance Thomas is a composer, educator and entrepreneur. His music has underscored blockbuster commercial success and critical acclaim, including an Oscar, an Emmy and billions of dollars in video game and film sales worldwide. Game credits include DOTA 2, Lord of the Rings Online, James Cameron’s Avator, Heroes of Might and Magic, Peter Jackson’s King Kong and many more. As an educator, Chance works with universities, colleges and conferences to help students and professionals navigate the intersection of music scoring, technology and business. He has served on advisory boards for Full Sail University, Brigham Young University, the Game Developer’s Conference and the Game Audio Network Guild. His business interests range across studios, publishing and audio services, successfully supporting a music career spanning more than 30 years.